The importance of Facebook Marketing for the success of a business grows as more and more people join Facebook. 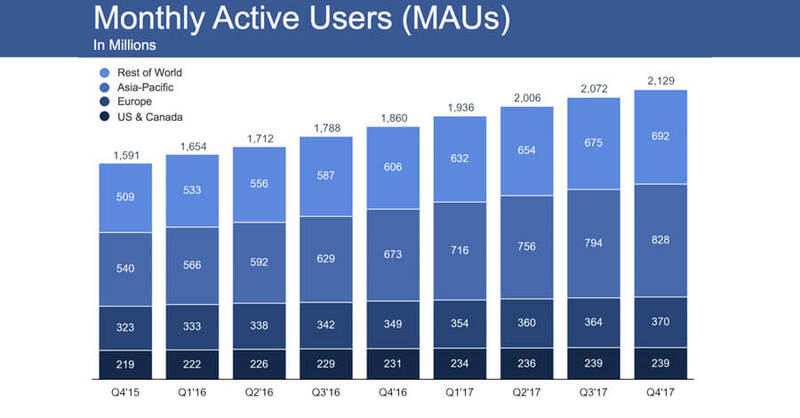 With 2.20 billion monthly active users reported by the end of June 2018, Facebook stands stronger than ever in their mission to connect the world. Promoting your book or E-book with the help of Facebook Ads is of major importance. Your readers are most likely to have a Facebook account and access it at least once a day. This is the main reason why advertising on Facebook makes a lot of sense. 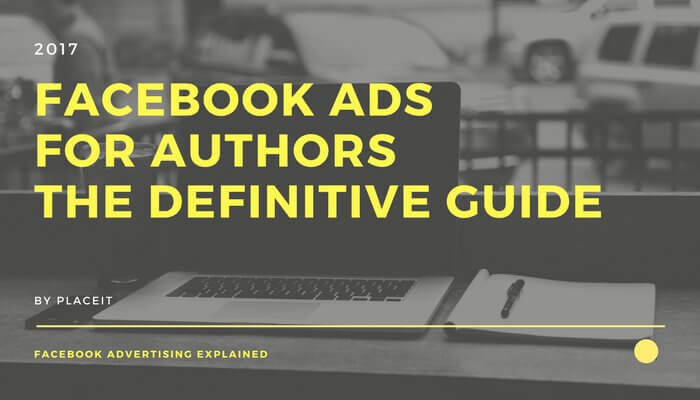 Authors though, constantly wonder how to advertise and promote an E-book on Facebook, reason why I decided to create this guide for you. There’s so much to learn about Facebook Advertising, and a lot of people actually take a Facebook ads course which is recommended, if you have the time. 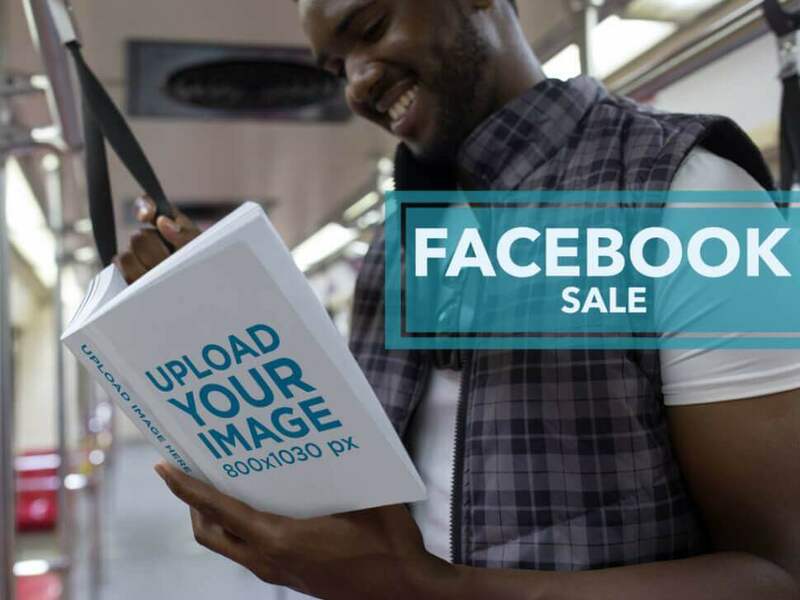 But with a visual and proven guide like this one, you won’t need to hire anyone to effectively advertise on Facebook or will need to take a course to sell more books. 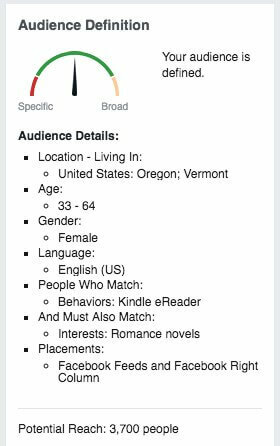 After reading and following closely the detailed steps on this facebook ads guide specially created for authors you will build a great ad that will help you boost your book sales. ✓ A Facebook Ads Manager account. ✓ Your book’s cover art image file. Don’t have one yet? Learn how to create your book or E-Book Cover here. ✓ Your ideal customer’s buyer persona. ✓ The URL of the site we’ll want to send your readers once they engage with your ad. Head to the Facebook Ads Manager screen and click on the green button on the top right corner that says “Create a new ad”. Choose traffic as your marketing objective. By choosing this option you will be able to send people directly to your Amazon’s book listing which is what we want. Here, you will enter your account and billing information. Select the country where you are located and your desired currency and time zone. Once you give your Ad Set a name, you will be asked where you want to drive traffic to. Choose Website or Messenger. This option allows you to create an offer people can save and get reminders about but it will not work for us at the moment, so let’s ignore it. Here is where your customer buyer persona will come in handy. 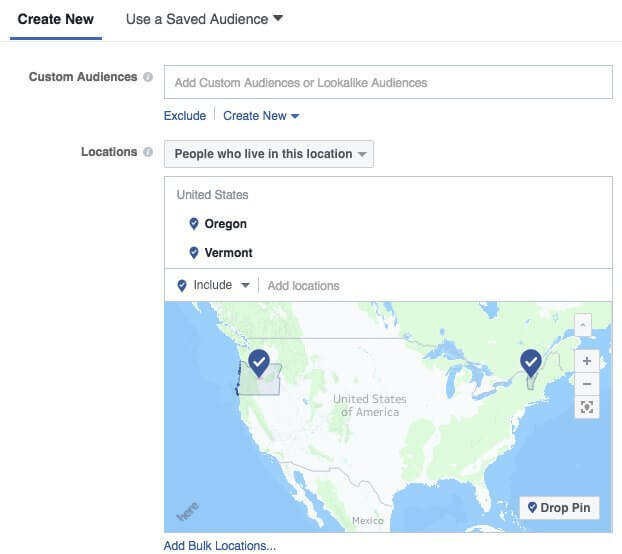 By defining an audience for your ads you will let Facebook know who you want to see your ads. By knowing the characteristics of the person that is more likely to engage with our ad you will benefit in two ways; first, Facebook will reduce the cost of your ads because the more accurately targeted your ads are, the more the user will be pleased, or not bothered at least, and a positive experience will be delivered. 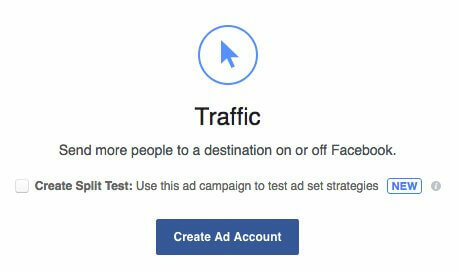 Second, the people who click your ads will be more likely to convert (make the purchase) and you will see a real monetary benefit from advertising on Facebook. Since you are probably just starting with Facebook Ads, you won’t be able to create a Custom Audience, so leave it blank. FYI, Custom Audiences are groups you create based upon your email lists, phone numbers, app users, or website retargeting. Now on location, choose to target “People who live in this location.” This option allows you to enter one or more global regions, countries, states/regions, cities, postal codes, addresses to show or exclude your ad to people in those locations. For illustration purposes, I chose to target the states of Oregon and Vermont because according to this survey, these two states are where people consume the most literature. Now. Choose the age range and gender of the people who will better enjoy your book. Then on Languages, choose the language your ad is displayed in. In this guide’s case, English (US) will do the job. Now comes my favorite part, the Detailed Targeting section. 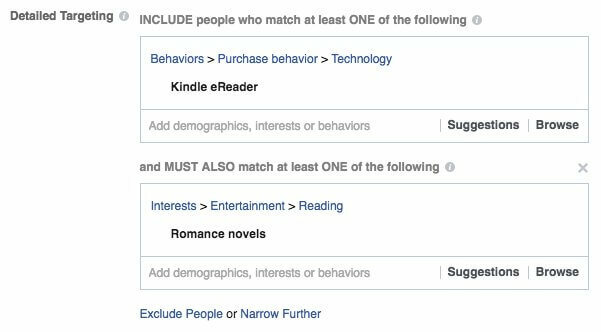 In this section, you are able to define your audience by including or excluding demographics, interests, and behaviors. Demographics: education, relationship status, income, job title, employer name, language, financial, homeownership, parental status, etc. Interests: everything from Facebook brand pages to celebrities and every topic you can think of. Behaviors: shopping habits, spending, mobile, device ownership, travel habits, etc. My ideal customer is most likely to own a Kindle eReader AND enjoys reading romance novels so that’s what I typed in. Going for “intersections” like I just did, helps to narrow down the audience and lazer targeting your audience. 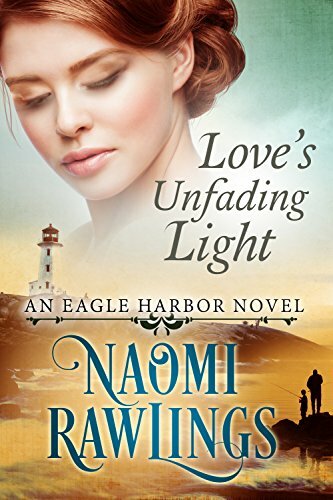 Because a person that has a kindle reader might not be necessarily interested in romance novels, targeting readers who have a kindle e-reader OR enjoy reading romance novels might end up displaying my ads to the wrong people. These are variables in the advertising equation which can always be optimized in the future. 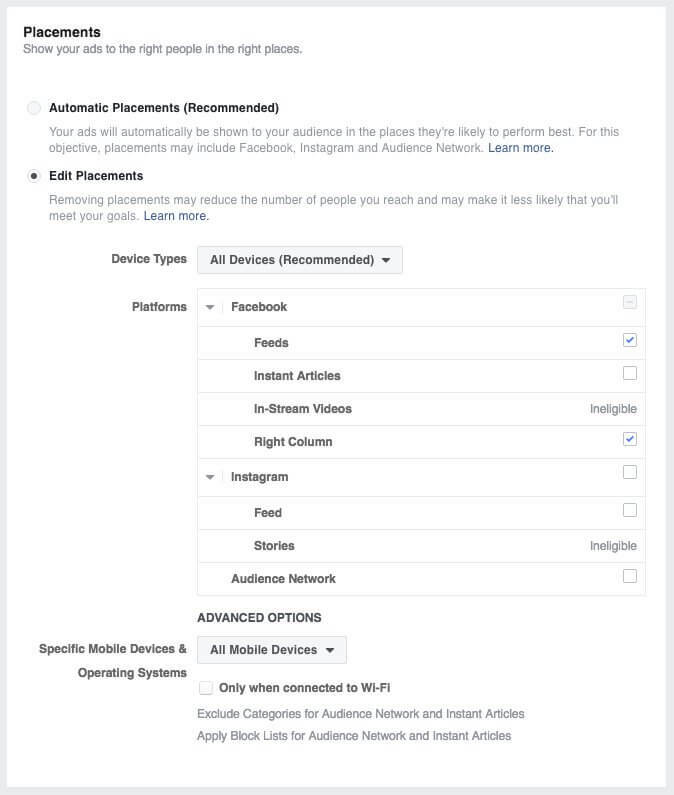 Under the Connections section, you can choose to “Exclude people who like your Page” to deliver your ads only to new users. This is an optional step, you might choose to leave this blank or to target only your current Page followers, just don’t forget to tailor your ad’s creative accordingly. Here you will be able to define where will people see your ads. Choose to edit placements, deselect everything and select only to show your ads on user’s News Feeds (both mobile and desktop) and on the Right column on desktop. These are my recommended settings, but you are encouraged to prove me wrong. Personally, I believe that the audience I’m targeting will rarely be on Instagram, would engage with an ad featured on Facebook’s Audience Network or on an Instant Article, reason why I deselected them. 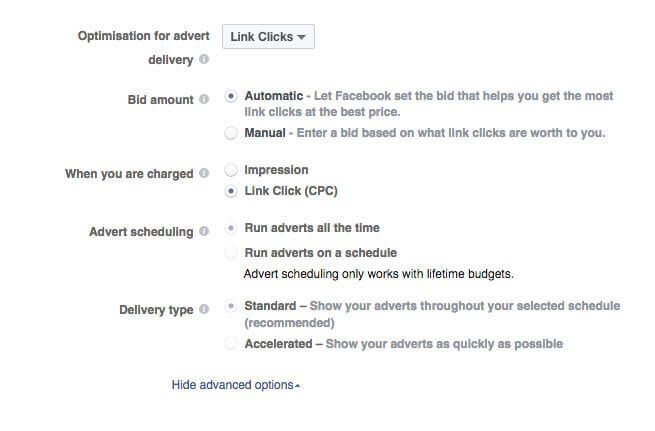 Here you will define how much you’d like to spend, and when you’d like your ads to appear. Start with low quantities first, the minimum is $10.00 USD, to test the effectiveness of your ads. You don’t want to go and invest $500.00 USD when you haven’t tested your ads yet, right? Remember that running tests is super important when advertising on Facebook. By setting the daily budget to $10 USD and the ad to run for 7 days, I will be able to run a decent test and see sales go up for these 7 days. 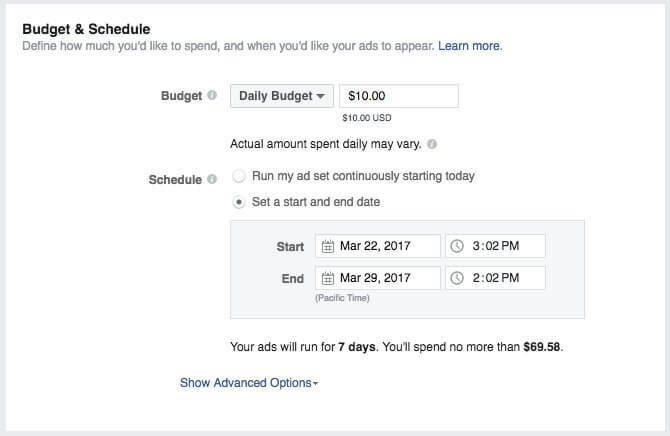 Now click on “Show Advanced Options” and let’s tell Facebook that we only want to be charged when a user actually clicks on our ad. This is super important, choosing to be charged by impressions just works if your goal is to boost brand awareness, but this is not our case, this time we want CLICKS & SALES! On the right side, you will see a summarized version of your choices. Your audience definition “meter” should be leaning towards the left side. Don’t forget, the more specific your selected audience is, the more effective your ads should be. In my case, the potential reach of my ads is 3,700 people as can be seen at the very bottom. Remember that having a very well defined audience will allow you spend less in ads and get way more revenue. On this Ad Creation section, you will be able to add text and media to your ad. Facebook has moved to a “video first” strategy. We all love the videos and Facebook knows it, besides, video content is able to keep users engaged in the platform for a long time which is beneficial for Facebook as well. Knowing this, promoting your book with a video is a must so go ahead and choose the “Single video” format. In case you don’t have a video already, the easiest way to get a professional video done all by yourself is to go to Placeit.net. Once in Placeit’s site, choose a book video template, I used this E-book video template for this ad. Then upload your book’s cover art, I used this cover book If you don’t have a book cover yet, here’s a guide that shows you how to make a great book cover with Placeit’s book cover maker. That’s it! Download your high definition MP4 video and upload it. See how cool this E-book mockup video looks! 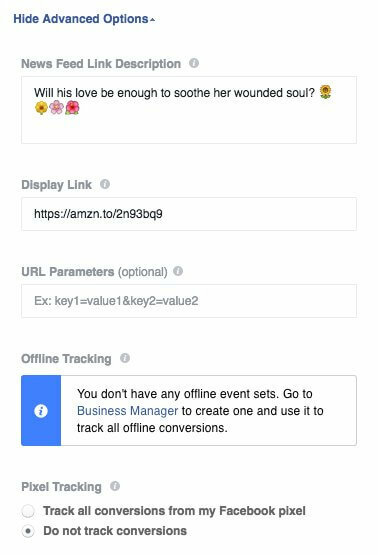 Now connect your Facebook Page and copy and paste the URL where you want to send your audience to. It is time now to get creative with compelling copy that will talk to your audience and will help convince users of clicking or tapping on your ad. Use words to generate urgency, appeal to emotions, and use active verbs that will push users to make the purchase immediately. Since I’m selling an ebook, the call to action should say “download” because I want users to go to Amazon and download the ebook to their Kindles. Now under Advanced Options, add supporting copy and a short display link that will tell your audience where they will be taken to, in this case, to Amazon. 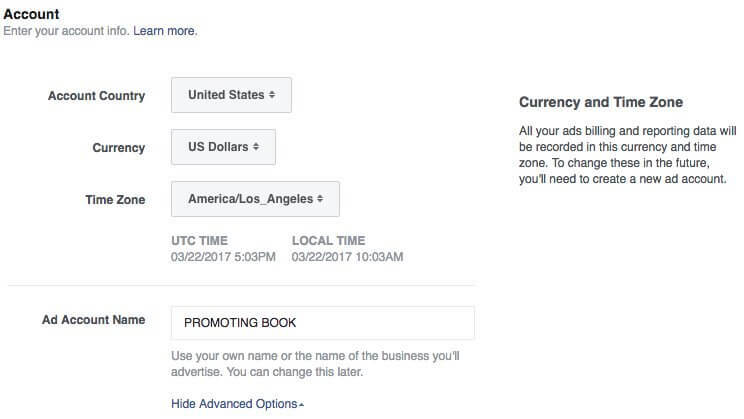 Your Facebook Ad Is Now Ready! Hit the “Place Order” green button and you will be good to go. This is the final result of my ad and it is a gooood looking one. You see, it wasn’t that difficult, was it? What If I Want to Advertise My E-Books with Images Rather Than with a Video? If you are not feeling like using video for your ad, you can always use images. The process is pretty much the same, go and choose the “Single Image” format. Again, Placeit will help you to create an eye-catching ad. So once in Placeit’s site, choose a book template, I liked this 3D book mockup for this ad. Download your high definition image file and upload it. And this is how the ad looks. See how cool this E-book mockup image looks! 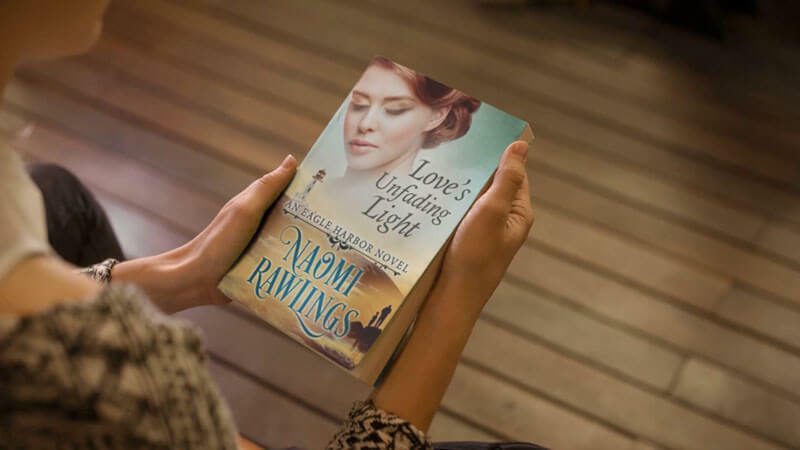 Want to Take Your Book Marketing to the Next Level? 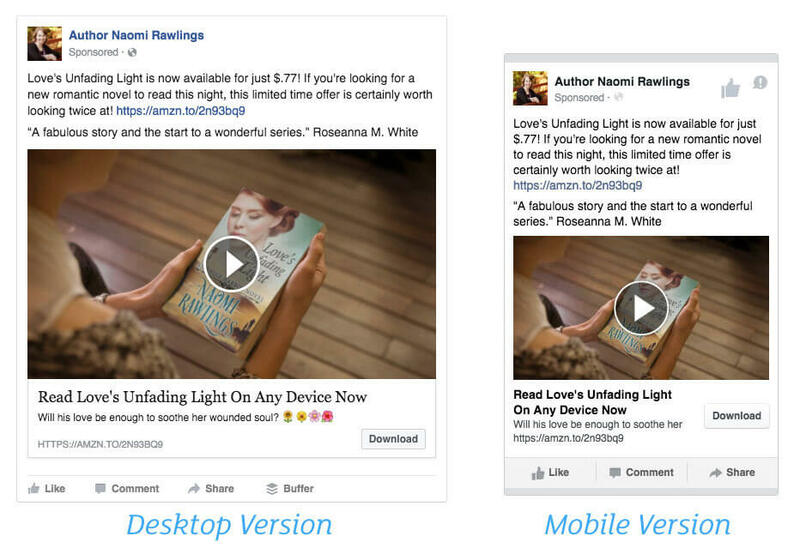 We now have new Facebook E-book Ads which look spectacularly good on your ads! 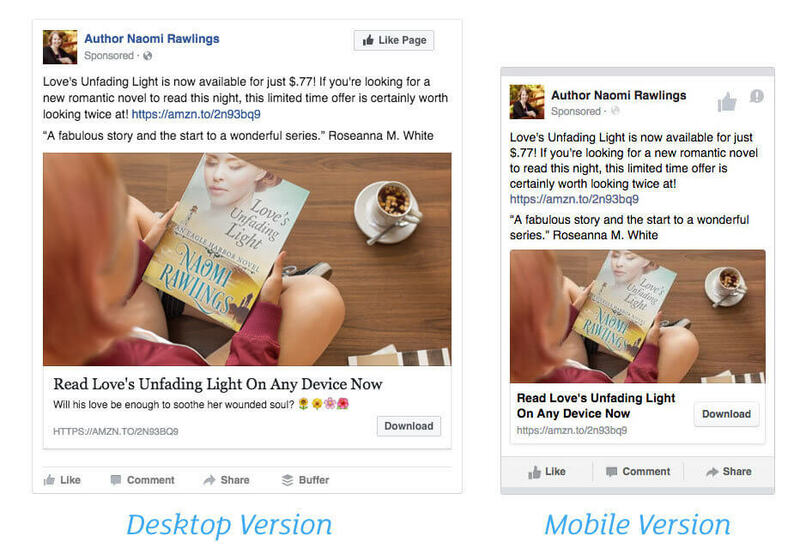 Facebook Ebook ad images are extra effective because you are able to add a compelling copy to them which will make your ads extra effective. Discounts are, of course, especially effective! You can also try our online flyer maker to drag everyone’s attention to your convention, book signing, special sale, anything you want! Create a 3D Book Mockup For Your Book Now! Sometimes it’s hard to understand priorities when starting a small business for your product or service. Every task is actually very important and it takes time to develop something great! Don’t feel overwhelmed, get your checklist and go one step at a time. A great way to market your business is to establish a solid brand right from the start, even your brand as a writer o a publisher. Branding your small business helps you connect with your targeted audience and being identified by them too, so yes, it’s worth it. Try 9 Tips to Brand Your Small business like a Pro. We Have Recently Launched Book Cover Maker! This is great news for all those authors out there. If you have an E-book or are planning a printed version of your book, you can now create your own cover . It has happened before that sometimes the designer may not get your idea. 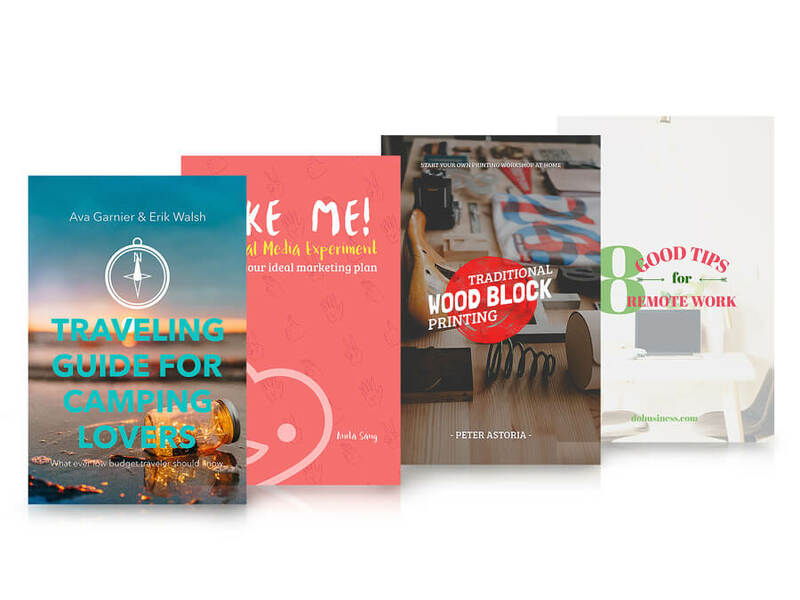 We give you a chance to explore designing your cover without needing any software, just do it online with all these book cover templates. 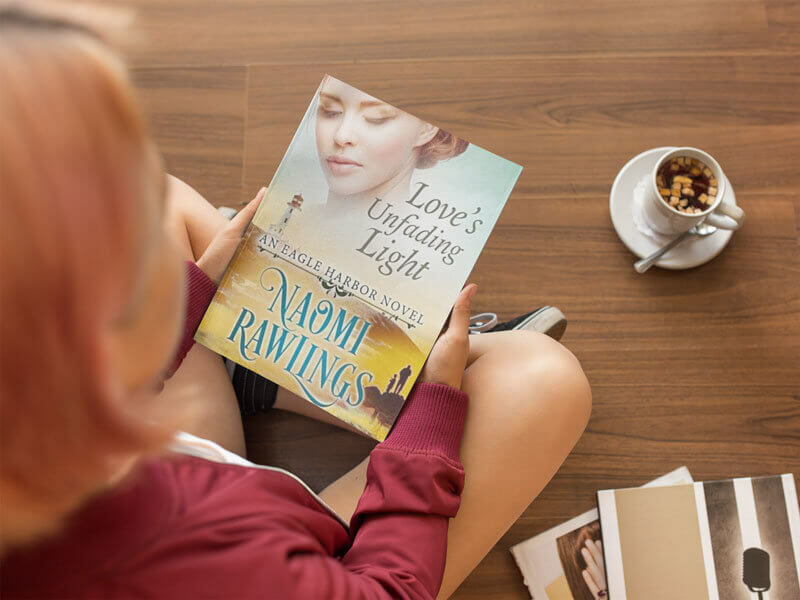 Enjoy getting your book out there by creating not only the story but the graphics your readers will always remember! That’s all for today. I hope you’ve found this guide useful and that you succeed self-publishing and selling books online. 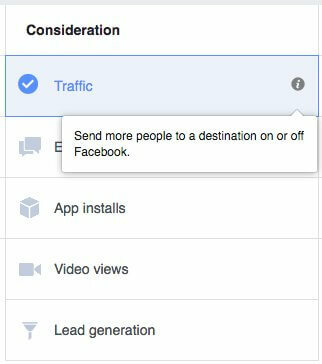 I will continuously update this guide to keep it relevant and will gladly add more tips and tricks for you as I use Facebook Ads myself and learn more on the subject. What are your thoughts? Any insight you’d like to share on what has and hasn’t worked for you in the past? Leave a comment and let’s start a conversation! 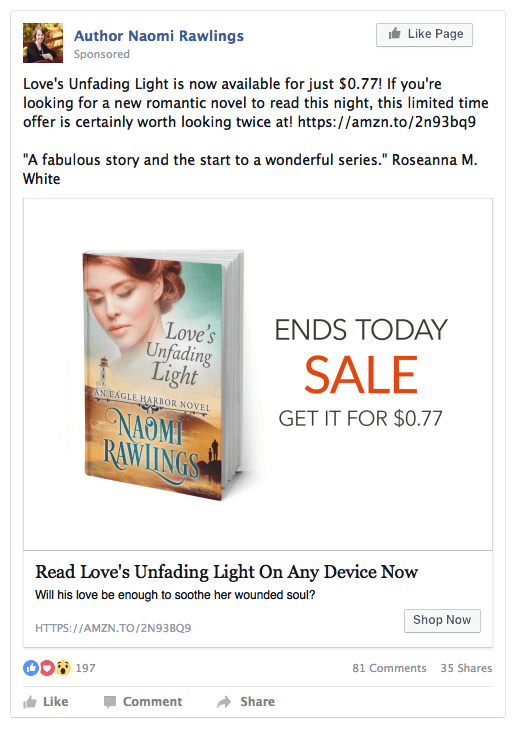 In this post we showed you how to use Facebook Ads to promote and sell your E-books. Placeit has an ever growing collection of E-book templates that are perfect for creating the professional book covers your audience expects. Master Facebook Ads with our guide to help you become a bestseller! "Placeit's Facebook ads really helped me boost my book sales"